Well I know that the final border still needs attaching but thought you might like to see how Little Sister is going. 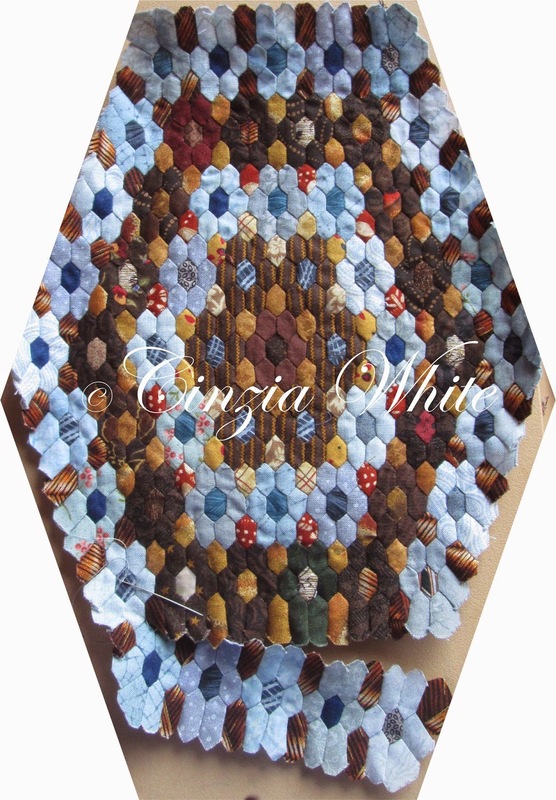 This blue hexagon is the final hexagonal borders next one is where I straighten it out and make it into a rectangle. Hope that is easier in real life than on the computer. Funny some things the computer does quicker but it can't show me the real life colour version. I'm finding it interesting just how much I'm learning as I join the bits and pieces. Did you realise that it is easier to have diagonal joins rather than long straight joins? Neither did I til the third time round ... yes sometimes I am a slower learner. Mind you working out what goes where for the floaters is easier to do if I am planning on having straight joins. I suppose you can't have everything. Mary sometimes good and other times?